(Newser) – Technology companies led a broad slide for US stocks Wednesday, extending the markets losses from a day earlier, the AP reports. Big tech names, which have far outpaced the rest of the market this year, took modest losses. Chipmaker Nvidia lost 2%. Companies that make consumer products also were big decliners. Energy stocks fell as the price of crude oil closed lower a day after its biggest loss since October. Banks and phone companies rose. Bank of America gained 2.1%. The Standard & Poor's 500 index fell 14 points, or 0.6%, to 2,564. The Dow Jones industrial average lost 138 points, or 0.6%, to 23,271. 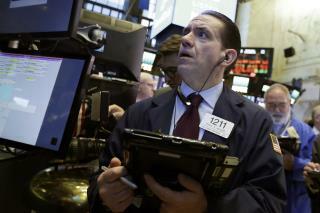 The Nasdaq composite fell 31 points, or 0.5%, to 6,706. Bond prices rose. The yield on the 10-year Treasury fell to 2.33%. Slowly but surely, the realization is going to sink in that the real backbone of the economy is not the rich but rather the middle class. A robust middle class actually helps rich people --- but good luck getting them to understand.